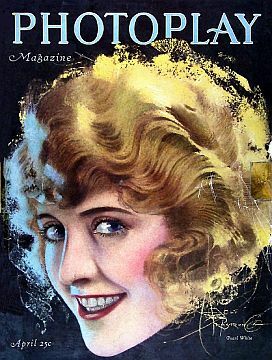 Silent film star Pearl White shown on the cover of Photoplay magazine, April 1920. (artist - Rolf Armstrong). Photoplay magazine, founded in Chicago in 1911, reached its zenith in the 1920s and 1930s, becoming quite influential in the early film industry. The magazine was renowned for its beautiful cover portraits of film stars by artists such as Rolf Armstrong, Earl Christy, and Charles Sheldon. By 1937, however, with the advancement of color photography, the magazine began using photographs of the stars. Shown here on the April 1920 cover is Pearl White, a silent film actress who by then was a popular star. She was born in March 1889 and became a well-known film actress after she starred in a 1914 silent film series, The Perils of Pauline. The daughter of a poor Missouri farmer, White grew up in Springfield and during high school became interested in acting, participating in a local theater company. At age 18, she joined the Trousedale Stock Co. as a part-time performer, and later full-time, appearing throughout the American Midwest. In 1907 she married fellow actor Victor Sutherland, but they soon separated and divorced. By 1910, White was offered a chance by French film maker Pathé Frères to perform in The Girl From Arizona, the company’s first American film produced at its new studio in Bound Brook, New Jersey. She then worked for several independents, including Lubin Studios, until the Crystal Film Co. in Manhattan gave her top billing in numerous short films. With that recognition, Pathé offered her the starring role in The Perils of Pauline, the film series based on a story by playwright Charles W. Goddard. 'Perils of Pauline' movie poster. Released in 1914, The Perils of Pauline consisted of twenty episodes that used the heroine-in-jeopardy storyline to great success. It is considered by some to be the most famous suspense serial in cinema history. In the serials, week after week, Pauline evaded attempts on her life. She fought pirates, Indians, gypsies, rats, sharks, and her dastardly guardian. The unresolved, heroine-in-danger endings left audiences wondering what would happen in the next chapter, and kept them coming back for more. In the series, White performed many of her own stunts, and became known as the “stunt queen” of the silent film era. She was a daring, athletic, and active star, often placed in risky situations — sent aloft in a runaway balloon, trapped in a burning house, or left hanging from the side of a cliff (the cliffs of the New Jersey Palisades, in one filming location, credited with generating the new phrase “cliffhanger”). One of her famous stunts — in which she was tied to railroad tracks and had to be rescued from a speeding, rapidly-approaching train — was filmed near New Hope, Pennsylvania at a place later named “Pauline’s Trestle.” The Perils of Pauline was an enormous box-office success, and it made Pearl White a major celebrity; she was soon earning — in those times — the astronomical sum of $3,000 a week. At least part of Pearl White’s notoriety and the Pauline series success was due to a business battle in the newspaper industry. At the March 1914 premier of The Perils of Pauline in Chicago, for example, the film arrived in the midst of local turf war between William Randolph Hearst of the Hearst newspaper chain and Rufus McCormick of the Chicago Tribune.Hearst simultaneously ran newspaper serializations of the Pauline series as his Pathe films rolled out the movie version. Several months earlier, in December 1913, a competing heroine film by the Selig Co. film studios, The Adventures of Kathlyn starring Kathlyn Williams, had been condensed into print serials in the Tribune as the screen versions were running. In fact, during that month, the Tribune‘s circulation increased by 50,000. Mr. Hearst, meanwhile, had struck a business deal with Pathe to distribute the Perils of Pauline serials, and generally promote Pathe films, in his newspapers. Hearst newspapers in Chicago and elsewhere, ran simultaneous serializations in print as Pathe rolled out the Pauline series in the movie houses. Such collaboration between newspapers and the cinema was something of new phenomenon at the time, but it would prove to work to the advantage of both industries, an early example of “tie-in media deals” common throughout the entertainment and advertising worlds today. Advertisement in the Feb 25, 1915 edition of “The Sun” newspaper of Vancouver, B.C., Canada, for “The Perils of Pauline” film series. The full-page newspaper advertisement at right comes from The Sun of Vancouver, British Columbia, Canada, for Thursday, February 25, 1915. It’s an ad for the Dominion Theater movie house of Vancouver then about to debut the silent film, The Perils of Pauline — a new “photo play,” as such films were then called. In hyping the film, to be presented in series, the ad explains that The Perils of Pauline “is admitted to be the greatest series of Motion Picture Plays ever produced and shown to the public by any firm.” The ad also includes photos of both Pearl White — “the popular Pathe leading lady” — and her co-star, actor Crane Wilbur, who plays Harry Marvin in the film. The ad, announcing the showing of the first episode in the series, continues with its boosterism: “The Players, the Author and Pathe Resources guarantee to you the Quality of the Production. The story is clean and wholesome, yet with plenty of Thrills, Adventure, Narrow Escapes, Villainy, Love, scattered throughout. The grandest scenic effects; the most thrilling, almost unbelievable spectacular accidents appear in every episode. You can now see “THE PERILS OF PAULINE” because it is what you have often hoped you would be able to see sometime. Come and see it. You will be more than pleased.” The bottom half of the ad includes a photo from one scene in the film, and explains that “an episode will be shown every Thursday, Friday and Saturday.” Also on the page near the bottom, are two smaller boxes flanking the photograph that remind readers to “watch for the story in The Sun,” that is, the serialization of the film series then being run in all Hearst newspapers. At the very bottom of the ad is a synopsis of the story. 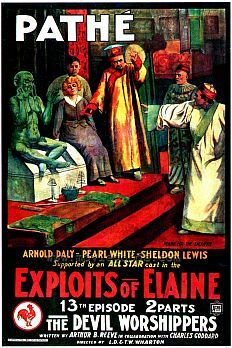 'Exploits of Elaine' movie poster. Pearl White, meanwhile, followed the Pauline series with an even bigger box-office winner, The Exploits of Elaine. This series tells the story of a young Elaine who, with the help of a detective, tries to find the man who murdered her father. 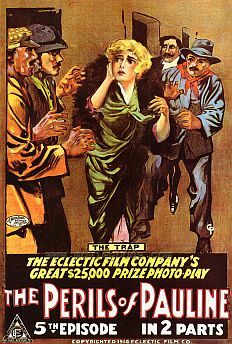 The Elaine series expanded to more films in 1915. White meanwhile, continued flying airplanes, racing cars, swimming across rivers, and undertaking other assorted feats in a number of successful action-based serials. Pearl White eventually sustained injuries in her work and was forced to use a stunt double in later films. All of her films were made at East Coast studios and locations, and it is said she never visited Hollywood. By 1919, Pearl White was a wealthy woman when she met and married World War I veteran Wallace McCutcheon, who also became an actor, director and cinematographer. However, this marriage also ended in 1921. Two years later White made her last American film. But she wasn’t finished acting. Influenced by her French friends at Pathé, White was drawn to the artistic community in the Montparnasse Quarter of Paris, where she lived and made her last film. Although still a worldwide star at the time, and offered many roles in French films, White took on a stage role in a Montmartre production called You Lost the Ball, which led in 1925 to a starring role with comedian Max Wall in the “London Review” at the Lyceum Theater in London. Back in France, meanwhile, White had invested successfully in a Parisian nightclub, a resort hotel/casino, and thoroughbred race horses. She lived well in the exclusive Parisian suburb of Passy and also owned a villa in Rambouillet. The poor girl from Missouri who had learned to be frugal with money, was now hobnobbing with the European elite. In her third marriage, to Greek businessman Theodore Cossika, she found a traveling companion, and the new couple toured the Middle East and the Orient and also acquired a home near Cairo, Egypt. Pearl White spent her final years in Paris, overtaken in those years by alcohol, possibly used to dose chronic pain from her past film-stunt injuries. By 1933 she was hospitalized, which led to medicinal drug addiction. Her last few years were reportedly spent “in a painful alcoholic haze.” She died in Paris from cirrhosis of the liver was buried in the Cimetière de Passy. She was 49 years old. Today, a full-length version of The Perils of Pauline series is not known to exist, although a reduced nine-reel version was released in Europe in 1916. In recent years, Indiana University also transferred 9 episodes from her Pauline series to DVD format. However, The Exploits of Elaine does still exist and has been selected for preservation in the U.S. National Film Registry. Pearl White has also been honored with a star on the Hollywood Walk of Fame. Her contribution to film history is seen as advancing both the serial-action genre and expanding the role of women in film. Other stories of early film stars at this website that may be of interest include: “A Star is Born, 1910s” (studio creation of early film celebrity); “Anna Q. Nilsson, 1910s-1920s” (history of a silent film star); and, “Talkie Terror, 1920s” (the Hollywood peril of “talking pictures”). Additional stories of similar interest may be found at the “Film & Hollywood” and “Celebrity & Icons” category pages. Thanks for visiting — and if you like what you find here, please make a donation to help support the research and writing at this website. Thank you. – Jack Doyle. Pearl White on the cover of 'Pictures' magazine (U.K.), August 1922, in a scene from the film, 'Know Your Man'. Tim Dirks, “The Perils Of Pauline (1914),” Greatest Films, Filmsite.org. Adelle Whitely Fletcher, “Reconsidering Pearl,” Motion Picture, February, 1921. Manuel Weltmann, Pearl White: The Peerless, Fearless Girl, U.K.: A. S. Barnes, 1969, 266 pp. Kalton C. Lahue, Ladies in Distress, New York: A.S. Barnes & Co., 1971. David W. Menefee, The First Female Stars: Women of the Silent Era, Connecticut: Praeger, 2004. “Rival Press Magnates Are Locked in Battle Over Serial Heroines,” in Cinema Year By Year, 1894-2005, London: Dorling Kindersley, Ltd., 2005, p. 106. Exploits of Elaine film clip at Google – This is chapter 9 of the 1914 serial “The Exploits of Elaine”, starring Pearl White. It runs about 21 minutes. Other clips also available there. “Rare and Out-of-Print Films Now Available at IU Through Digitization,” October 24, 2005, Indiana University.